This side dish is one of my favorites - it's a crowd pleaser, it's a great seasonal dish, it's flexible and will suit a fine dinner party or just a quick weeknight meal, and... it's SO SIMPLE. Let's go ahead and hit on the first major flaw of this post: this dish is seasonal. It's season: fall/winter. ....And we're headed into spring. Nevermind the 8+ inches of snow we had on the ground this weekend (I'm not bitter). I'm a bit behind publishing this post - seeing as how I cooked it for the blog back in December. But hey - you'll still be able to get some butternut squash from the grocery store for a few more weeks (fingers crossed for my sake). I digress. What am I supposed to be talking about? Peel the squash using a vegetable peeler. Hopefully yours is much sharper than mine, or you'll spend 10+ minutes doing this and are likey to sacrifice a chunk or two of your finger. Cut the squash lengthwise and scoop out the seeds and stringy stuff (very technical) from the bulbous ends and discard. Lay on the flat side and trim the top and bottom. To cut into large dice, cut lengthwise into 1 inch strips, then turn and cut into 1 inch cubes. Now, here's where it gets really technical. 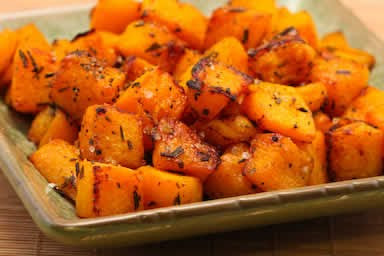 To the squash you're going to add olive oil, salt, pepper and rosemary. And if you're feeling it (I usually am) a couple of cloves of minced garlic. The amounts will totally depend on the size of your squash. And your taste preference. Remember you can always add more salt and pepper later. I love the taste of rosemary, so I heavy up on the stuff. Fresh is best. Do the oil in phases if you have to - make sure you don't get too much. So, basically, the above paragraph is all you're gonna get as far as measurements go in this recipe. You're on your own! (muahahahhaha) Kidding. I believe in you! Mix everything together in a big bowl. I use my hands. 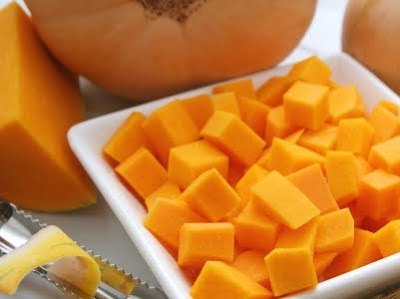 Place the squash on a cookie sheet or in a roasting pan in an even layer and put into a 425-degree oven for 25-35 minutes (they'll be fork tender when they're done). In order to get the 'crispies' (which The Stallion loves), turn the squash only once or twice while baking. Turn up the heat at the end if you need to. Serve hot! Thanks for commenting on the Cupcake Throwdown post on our blog. I love the look of your blog and the idea to become a member of Tasty Kitchen. Also, your "About" section is very fun. I too live in the flyover state and also do marketing (freelance). Great blog!